A wise man once told me, "We do not lose loved ones, we gain angels." Today, we gained an angel with the biggest heart out there. Ryan Mandel was one of the kindest, most loving, and caring individuals in this world. Ryan's family was his first priority, and he would go to any length to make them happy. He has also made a major impact on hundreds of struggling individuals' lives, and gave back to the community on a daily basis. 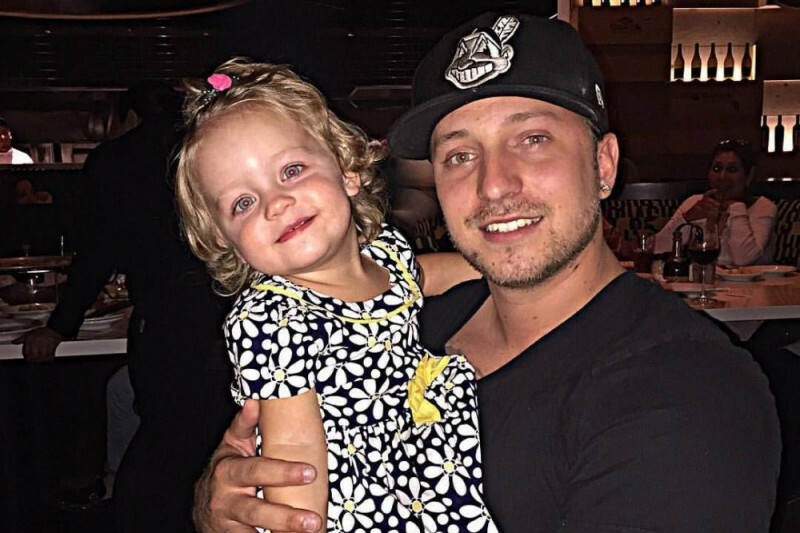 He was such a selfless individual, and now we ask for the community to help give back to Ryan and his family in order to help finance his memorial services and final expenses. Ryan's memorial celebration of life is tentatively scheduled for Saturday, January 7th at 4pm. The burial service will be on Sunday, January 8th with more details to come. I just want to start by expressing my gratitude to everyone this email is going out to. Each one of you graciously donated and supported us through a very difficult, trying time. We are so grateful for each and every one of you and the love and support you all have shown us along the way. 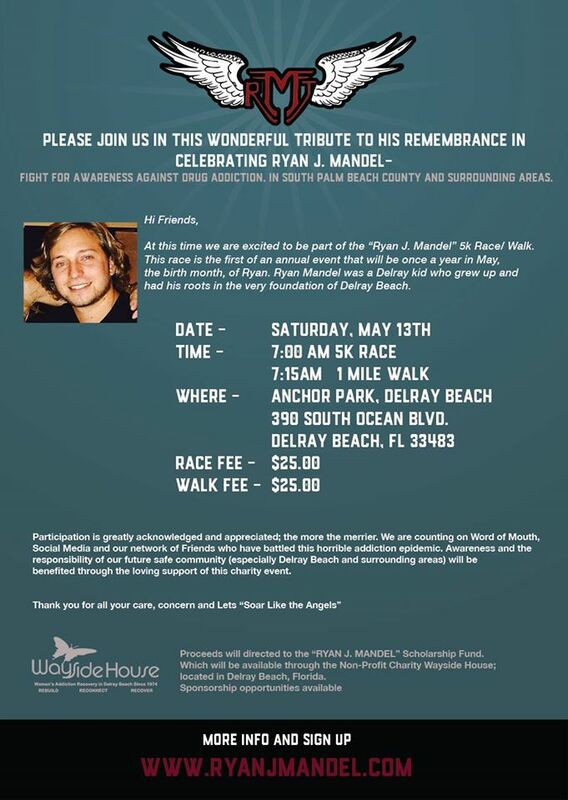 With that being said, we are very excited to share with you the “Ryan J. Mandel” 5k run/1 mile walk. This race is the first of an annual event that will be once a year in May, the birth month, of Ryan. Ryan worked a 12 Step Program for almost 4 years and along the way discovered his passion for helping others. We strongly believe that Ryan would want his legacy to live on through helping others who struggle with the disease of addiction. All proceeds of this event will be directed to the “RYAN J. MANDEL” Scholarship Fund, which will be available through the non-profit charity, Wayside House; located in Delray Beach, Florida. This scholarship fund will help people get in to treatment who may not have the opportunity to otherwise. 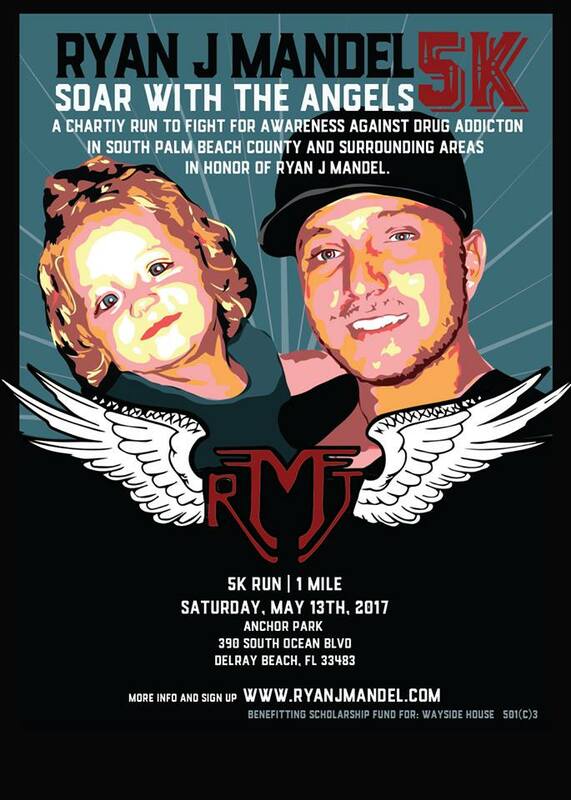 We hope you can join us in this wonderful tribute to his remembrance in celebrating RYAN J. MANDEL- fight for awareness against drug addiction, in South Palm Beach County and surrounding areas. If you or anyone you know may be interested in sponsorship opportunities, please reach out to ryanjmandelcharity@gmail.com. We are looking forward to seeing you all this weekend at Ryan's memorial and celebration of his life which is being held on Saturday, January 7th, 2016 at Old School Square Gymnasium in Delray Beach—6pm. There will be food and drinks provided. The burial ceremony will conclude the weekend at Evergreen Cemetery in Ft Lauderdale- 2pm. We having been planning a very special celebratory weekend in honor of Ryan's life. With that being said, please RSVP to the event link below if you will be attending so that we can finish planning accordingly. We hope to see you all there and thank you from the bottom of our hearts for all the love and support you all have shown. If you have any favorite pictures of Ryan, please email margotmandel7@gmail.com so that we can add them to the slideshow for the service. Great! Let me know if I can help - my organization does a 5K run in Feb. up in WPB. Prayers for you and your family, Juliet. My deepest condolences to you Margot and your entire family.